We all know about President Trump’s mispronunciation of “Ji-nah” and his major oops referring to “Be-YONS-ee.” So as not to be partisan, Hillary Clinton had her problems saying the pop icon’s name as well. She called her BAY-on-say once on the campaign trail in Iowa. Former President George Bush, well known for his pronunciation gaffes, said it best, “I have been known to mangle a syllable or two myself.” He’s not alone; even the best American wordsmiths do mispronounce their fair share of words. Americans are somewhat tolerant regarding pronunciation errors when the mistakes involve infrequently used foreign phrases, place names, technical terms, dialectical differences, or idiomatic expressions. However, for various reasons, we do demand uniform pronunciation of some words. Following are our Top 40 Pronunciation Pet Peeves in no particular order. 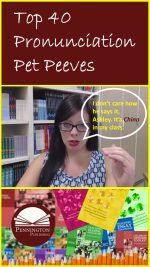 Also, make sure to check out the Top 40 Grammar Pet Peeves and the Top 40 Vocabulary Pet Peeves. 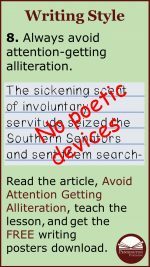 Find out all of your grammatical mistakes and the words you misuse before “You-Know-Who” points them out to you. And for the culinary snobs among us… It’s “bru-chet-tah” or “bru-sket-tah,” but definitely not “bru-shet-tah.” And it’s “hear-row,” not “gear-row” or “ji-roh.” If you’re eager for more of the same, check out the 20 Embarrassing Mispronunciations that I have been guilty of over the years.